There was a time when jumping through a wreath of flame on a poorly engineered chopper was enough to give even the most jaded patriot a semi. Those simple days are gone, but apply the same formula a thousand feet above an urban area in the middle of the night and you stand a decent chance of a sudden rush of blood to the crotch. Spectacular Stunt Race for Bikes. You can never have too much of a good thing, especially when that thing is a gravity-defying loop-the-loop over Fort Zancudo. Kiss your already fragile grip on the laws of physics goodbye on this intense Stunt Race for Super cars. The great woodlands of San Andreas are one of our most bountiful resources, providing an endless supply of endangered timber, plenty of discreet hideaways for doomsday cults, and now some of the most suicidal dirt bike jumps in the country. Stunt Race for Bikes. Time to ditch the private jet, saddle up, and learn a thing or two about corporate dominance with this Stunt Race for bikes through, around and over almost every skyscraper in central LS. Are you susceptible to paranoia? Feel like the walls are closing in? Often have the sense you're trapped with no escape? Come play this Stunt Race for Muscle cars and give your neuroses something to really latch onto. A few massive slingshots and vertical drops around Mount Chiliad will play havoc with a full stomach. Time to skip lunch... and breakfast... and to pack a change of underwear. Point to Point Stunt Race for the Sports class. 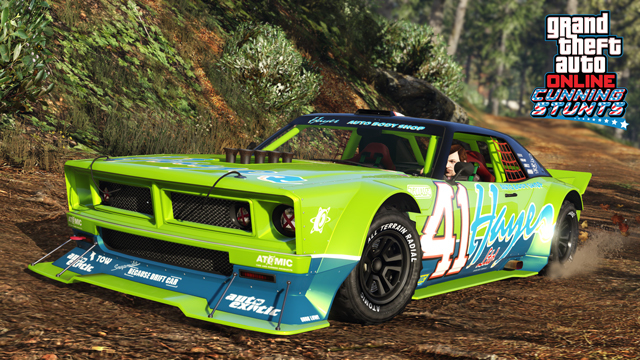 The livery-clad racing fleet also expands today with the addition of the Ocelot Lynx, Declasse Drift Tampa and Western Cliffhanger, growing the Sports and Motorcycle classes. 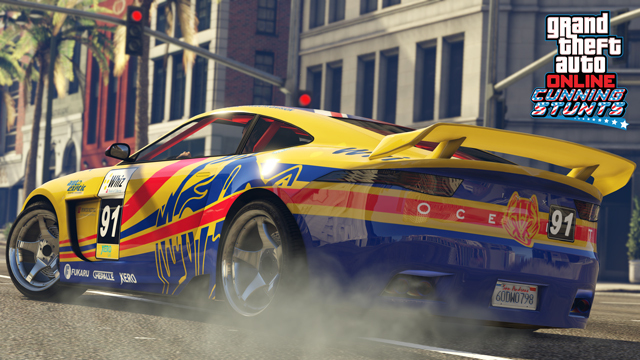 And for high-stakes racing aficionados, a new Premium Race popping up over the weekend will put your best Sports cars to the test in Zebra (look for the yellow blip at Legion Square). Expand your collection of stunting attire with the Silver Jumpsuit which comes complete with matching helmet. This unlock is free this week and will appear in the Special Items in your Wardrobe as soon as you log-in. Make sure you log-in before July 25th to redeem! The 20% discount on all Garages & Properties with Garages continues this week – just what you need to accommodate the 3 new vehicles releasing with this update. If you’re already fully maxed out on room in your garages, don’t forget you can always use your second character (and the shared bank account) to open up to 5 more garages, and 50 more parking spaces. Where last week’s bonuses were all about performance upgrades, this week it’s all about aesthetics with 20% off Spoilers, Wheels, Tire Smoke, Skirts, Exhausts and Horns. Perfect for making sure your brand new Ocelot Lynx or Declasse Drift Tampa is a show-er and not just a go-er. 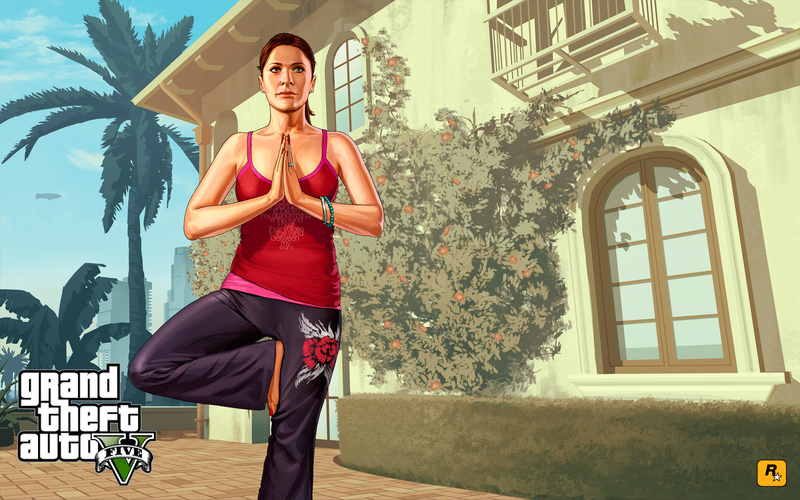 Get going and join the fun in the forums! 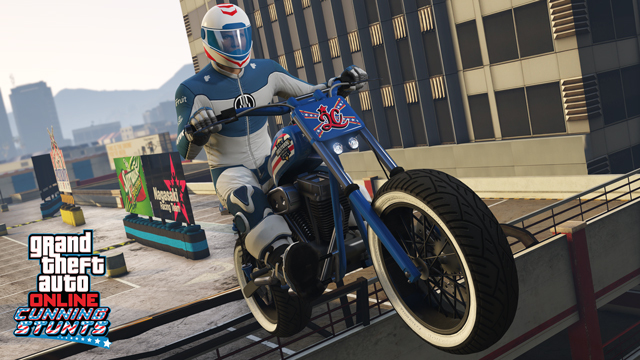 More Stunt Races and Vehicles, Bonuses - A week into the stunting bonanza and Rockstar has added 6 new races and three new vehicles to the mix.